With Great British Bake Off in full swing, Dr. Oetker has teamed up with X-Factor star Stacey Solomon and baking vlogger Emily Leary in a series of fun baking tutorials. From mastering the art of cake decorating to whipping up delicious treats to impress friends and family, each tutorial will help people at home perfect their skills and techniques to become an Even Better Baker. The pop sensation and mum of two is also joined by Emily Leary, creator of blog ‘A Mummy Too’, as part of Dr. Oetker’s Even Better Baking Team. Each week, the baking duo takes popular recipes and showcases the best hints, tips and techniques to help make them ‘Even Better’. Commenting on her involvement, Stacey said; “I absolutely love to bake and was so excited when Dr. Oetker asked me to join their Even Better Baking Team. For me, baking is all about having fun with the kids. I love to experiment and try new recipes with my boys even if they don’t turn out the best, so it’s been great to learn tips that actually make a difference to my bakes. 1. Sift flour and icing sugar into a bowl and add cold cubed butter. Pulse the mixture, until it resembles fine breadcrumbs. Add the egg yolks and then pulse until the dough begins to come together. 2. Preheat the oven to 200°C (180°C Fan, Gas Mark 6). On a lightly floured surface, roll out the pastry thinly and cut out 16 x 8cm (3 ¼ inch) rounds, re-rolling as necessary. Fit each circle of pastry into sixteen 6cm (2 ¼ inch) diameter, 2cm ( ¾ inch) deep tartlet tins. 3. Neaten the edges and place a baking case in the centre of each. Fill with baking beans or raw rice. Arrange the tins on a baking tray. 4. Bake for about 8 minutes until lightly golden round the edges. Carefully remove the beans or rice and paper. Prick the bottom of each case and return to the oven for a further 5 minutes until the pastry is lightly golden and cooked through. Cool for 10 minutes before carefully slipping the pastry cases out of the tins. Put on a wire rack to cool completely. 5. For the topping, put the Arrowroot in a small saucepan and blend with a little of the fruit cordial to make a paste. Stir in the remaining cordial and gradually bring to the boil, stirring, until clear and thickened. Transfer to a heatproof jug and leave aside to cool. 6. When ready to serve, whip the cream until softly peaking. Sift the icing sugar on top and add the Vanilla Extract. Gently mix into the cream. 7. Spoon the vanilla cream into a piping bag fitted with a large plain nozzle. Pipe a portion of cream into each tart case to just fill the centre, keeping the level just below the pastry edge. 8. Arrange blueberries and raspberries on top of the cream. 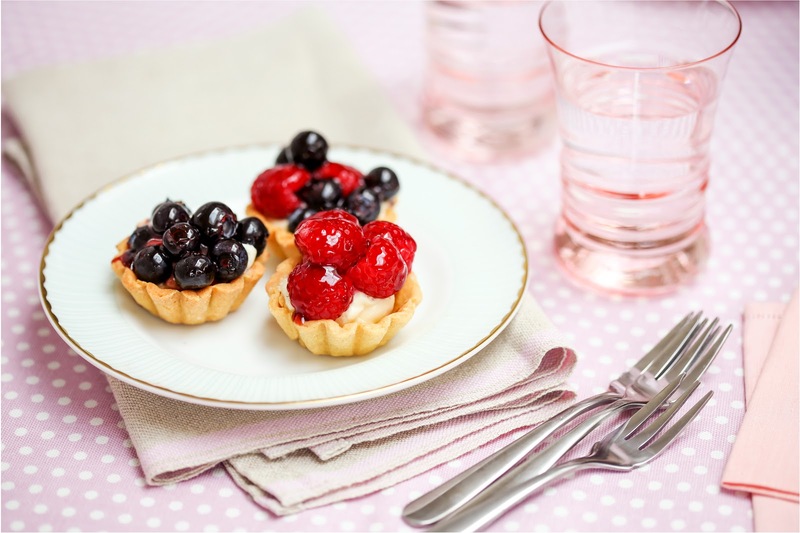 Using a broad, soft bristled pastry brush gently brush a generous amount of the arrowroot topping on top to completely cover the berries and cream layer – the glaze will be sticky, so it is best to hold each tartlet over the jug as you brush the top. 9. Arrange the tartlets on a serving plate and serve with the remaining Arrowroot topping as an accompaniment. Here is the video. I recommend watching this first as Emily makes it look so easy. I can’t wait to make these. They look delicious! I have lots of Dr. Oetker staples in our pantry but it will be my first time using Arrowroot powder- you learn something new every day! To keep up to date with all the latest Even Better Baking news, follow @droetkerbakeson Twitter, DrOetkerBaking on YouTube or like www.facebook.com/DrOetkerBaking.